So for your entertainment, I present to you, Mimi’s and my first NATRC ride together. This is the First of Spring ride, held in Alpine (just outside San Diego, around El Cajon), CA, in April 2002. 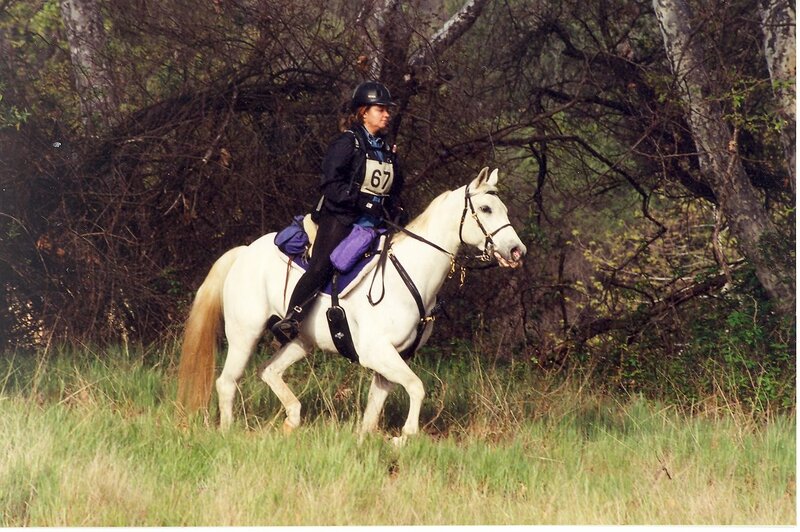 She would have been around 9, and we had been training for distance riding since summer of 2001. Dad’s foxtrotter mare Kelly had come down with EPM in the spring of 2001, and it was a slow road to recovery, bringing her back up to strength. We would literally trailer out to one of the trailheads, tack up, ride for half a mile out, then come back. We really embraced the idea of Long, Slow Distance training. FoS was a one day ride, and we were riding the Novice division, which was a total of about 20 miles. We were fortunate enough to be camped next to one of my best friends, Kaity, whom I had shown with in POA. Her POA Sonny is actually a cousin to Mimi, although they look nothing alike. Kaity had been riding NATRC for a couple years ahead of me, so she was able to give me a lot of tips and pointers. The rest of the story gets kind of fuzzy, as it was seven years ago, and time has dulled some of the more colorful moments. I recall check-in being fairly easy…we had showmanship and halter training to instill good ground manners (kind of). Ride day, however, started out very interesting. Alpine is close enough to San Diego to catch the morning fog that comes in off the ocean. The trail headed out next to a paved road that wound back though some horse properties, by some avocado trees, and then it turned into a wide dirt fire road that wound its way down into the base of a canyon area. Mimi discovered the joys of jigging 1/4 mile into the ride. We jigging down the canyon. We jigged across the floor of the canyon, whcih sort of went out, then looped back around through some oak trees and tall grass, where the ride photos were taken. We jigged back up the canyon to a P&R stop. We pulsed down, actually stood for mounting, then jigged our way the last 1/2 mile back to camp for lunch. And Mimi is still jigging. Inexperienced at distance and trail riding I might have been, but even I knew not to get into an argument with her on the side of a cliff, so she got to merely jig along with her head stuffed up Kelly’s tail until we made it down to the bottom, where she stopped jigging long enough to drink from the little stream flowing there. The most amazing thing? Her back wasn’t the slightest bit sore. We both came out with first place for Novice Junior in Horsemanship and Horse. I was completely staggered, and so proud of her! The next morning, my shoulders and arms were so sore, and I wasn’t feeling quite so complimentary. But I had a six hour drive back home to nurse my sore muscles. It’s pretty amazing…I remember a lot of odd details about that ride. I guess a first ride kind of burns an impression in your memory. Hope y’all enjoyed a little blast from the ride history past! ← Bulldog Canyon, or "The Dirty Grey Horse Ride"